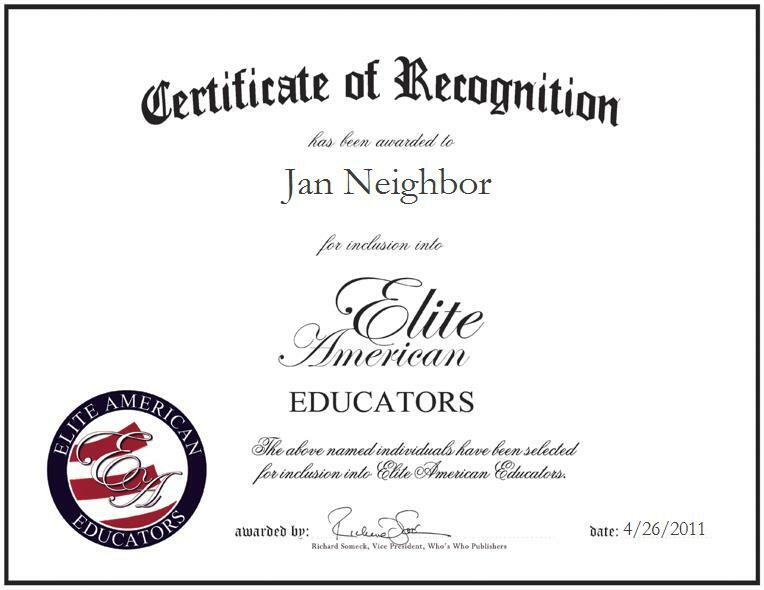 Dunellen, NJ, April 26, 2011, Jan Neighbor, Chairwoman of the Humanities Department of Rosa L. Parks School of Fine & Performing Arts, has been recognized by Elite American Educators for dedication, achievements and leadership in education. Following a 23-year career as an English teacher, Ms. Neighbor entered the administrative side of education at Rosa L. Parks School of Fine & Performing Arts as the chairwoman of the humanities department. She has been leading the department, and ensuring that its policies and procedures have been followed for the past 12 years. Not only does she coordinate professional development for the faculty, she also works with students on how to be independent academic learners and people moving forward in life. Outside of her work in education, Ms. Neighbor is also the chairwoman of the New Jersey women’s division of USA Wrestling. Additionally, she indulges in her passion for writing poetry, and has had several pieces published. She would like to retire from her current position and serve as an adjunct professor of writing in the near future.